Rafflecopter is a great giveaway hosting platform. Hosting giveaways is a great means of exposing your blog and creating viral contents. Giveaways can promote a blog and turn an unknown blog into a popular one, people like giveaways, we can also use giveaways to rewards our readers for their dedication to visiting our blog. Recently I hosted a giveaway on this blog and three winners emerged, I sure hope to host another soonest. I have also noticed that most bloggers use only Rafflecopter to host giveaways so I decided to share some Rafflecopter alternatives to host giveaways on this post, variety they say is the spice of life. So check out the Rafflecopter alternatives I am going to share here and use them to effectively host giveaways and promote your blog. 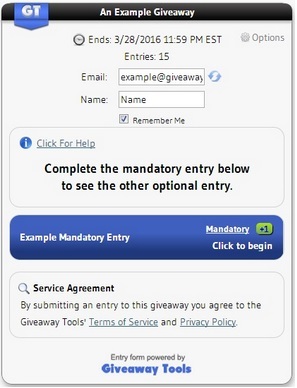 Giveaway Tools: Giveaway Tools is a web application that creates an embeddable entry-form used for promotions & giveaways. Giveaway Tools is integrated with Social media tools that helps one to promote his social media pages and profiles via a giveaway, feedburner email subscription that helps you grow your email subscribers, RSS subscription and even “Make your own entry” option etc. This tool is indeed a good Rafflecopter alternative you should consider when next you are hosting a giveaway. Generate winners via Random.org, PromoSimple’s random number generator, or manually select winners. With other advanced options for the paid packages. If you are looking for a Rafflecopter alternative to help you host your giveaways, try PromoSimple. PunchTab: PunchTab is one of the Rafflecopter alternatives you should really try out. This giveaway tool is quite popular with a lot of bloggers and webmasters, it is also known as the first instant loyalty program that rewards users for performing simple actions on a blog or site. 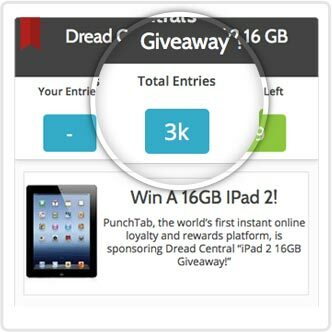 With PunchTab you can easily host your giveaways and create viral contents, try it out. I hope you will find these Rafflecopter alternatives interesting and useful to host your own giveaways successfully. If you know of any other Rafflecopter alternatives, please use the comment form to share with me, remember to subscribe to my RSS feed. these are some cool alternatives to rafflecopter, i have not heard of the other in this list, but I know of PunchTab and I use it for my giveaways. I will probably give others a try in the near future. The Rafflecopter tram ROCKs! Talk about dedication to creating the best widgets to bring bloggers and promoters together. I don’t know if they ever sleep? Wow desmond, thanks for releasing these two Rafflecopter Alternatives to Host Giveaways. I am also planning to run a set of giveaways on my blog soon as this article has given many two more alternatives to Rafflecopter. Probably am going to use PunchTab to host my giveaway. Thanks for the article. Its quite useful. I was known about Punchtab and Raffelcopter but i was unknown about PromoSimple ad Giveaway Tools, definitely I will try this application when I will introduce my next giveaway ! Thank you for sharing an useful post ! Hi Nwosu, this is very interesting and informative article on rafflecopter. Thanks for sharing dude. You need to find something you can reward your readers with and use it as your prize. Thanks for your comment. PunchTab seems to be the most popular giveaway tool among bloggers, thanks for visiting. Sure Rafflecopter rocks but since they introduced premium features, bloggers are beginning to look for Rafflecopter alternatives with better features. Don’t forget to let me know when you do because i will love t win something! thanks for commenting. Glad you found it useful, thanks for your comment. Do have a great week. Everybody loves a good giveaway Nwosu. Using the right tools to promote your offering can expand your presence quickly, and it can also help more people get in on your cool promotions. Rafflecopter and Punchtab were the awesome giveaway widgets that I know. Rafflecopter will be the best if one want to promote his giveaway daily on social networks. Whereas Punchtab is the best to refer more people to enter in the giveaway. But I haven’t tried and used Promosimple. Thanks Ryan for your contribution, yes a good and well hosted giveaway can shoot a blog into the limelight and could be the game changer you dream of in blogging. I am considering Punchtab for my next giveaway, just as you said PunchTab improves entrants into a contest more than Rafflecopter, though such feature only exist as a premium feature on Rafflecopter. I started off with rafflecopter but soon got so attracted to punchtab because of some of its unique features. The unique link and point reward feature helps you get more traffic as participants help pull hits to their referral link. Though this too constitute a source of link spamming, I’m still studying it out carefully. Thanks Babanature for your comment, do have a great week as well. Thanks for your comment Shameem, i am glad you find the post interesting. Wonderful and informative article, i really do appreciate it, planning to run a giveaway on my blog, and this is the best free option. Wow, I don’t know that we have more alternatives for punchtab. Only have tried Punchtab and Rafflecopter. Thanks for your comment Ambika, do have a great week. Definitely going to check out your giveaway, i love winning things. Thank you for including PromoSimple in your round-up of alternatives. We have a variety of new features that will be released very soon to further expand the functionality of the PromoSimple platform (including new Free features). If we can be of any help for setting up your future giveaways please do let us know! Thanks Dan i will surely do so. Glad you visited. Thanks for this article we were looking for Rafflecopter alternatives that were more cost effective and had more features. This helped a LOT! Giveaways in another important technique to attract more readers. Getting start with right choice is always better. BTW, Good points. I want to embed the Google + feature into the giveaway. Do any of these use Google + or just Facebook, Pinterest and Twitter? I’m so happy that I came across with your article. I used rafflecopter in my first giveaway (free version) and was not what I expected. I will try Punchtab to see how it works. You can use Rafflecopter, Woobox, Punchtab, Promosimple and Giveaway Tools with GiveawayFrenzy and get even more social shares by locking your giveaway before they even enter it. So depending on which tool you use you can get more out of it.